Regional Information Center "CARPATHIANS" » GEOLOGICAL LANDMARKS OF UKRAINE. 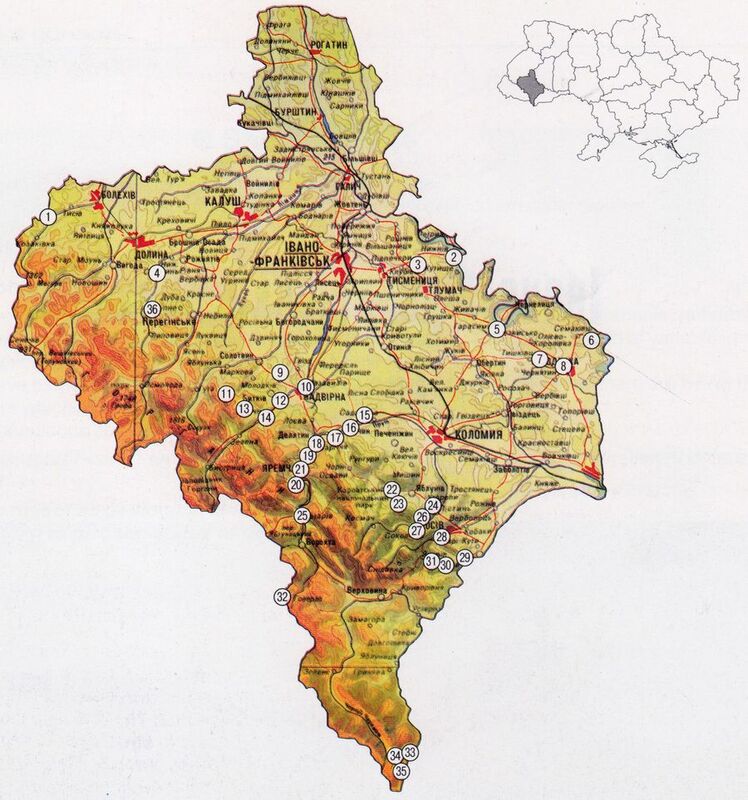 IVANO-FRANKIVSK REGION. GEOLOGICAL LANDMARKS OF UKRAINE. IVANO-FRANKIVSK REGION. In geotectonic respect southwestern section of the Region covers the thrust-nappe units of the External Carpathians and internal part of the Fore-Carpathian Trough while the central section — the external part of the latter trough, and the north-eastern section — the margin of Eastern-European Platform. Within the Region there are traced almost all major structures which comprise the External Carpathians — Marmaroshskiy Massif composed of mainly metamorphic schists and terrigenous-carbonate Paleozoic rocks; Rakhivskiy, Chornogorskiy thrusts, Krosnenska Zone, and Skyboviy Thrust that include deformed f lysch rocks of Cretaceous — Early Miocene age of about three thousand meters total thickness. Internal section of the Fore-Carpathian Trough comprises two large individual thrust-nappe units — Boryslavsko-Pokutskiy and Sambirskiy Thrusts. The first one includes deep-seated anticline structures complicated by one over another thrusts. They are composed of Lower Cretaceous — Lower Miocene flysch rocks which are overlain by thick Lower Miocene molassa that contains essential amount of salt-bearing and olistostrome rocks. In the country between Lyuchka and Cheremosh rivers these deep-seated structures attain the surface forming low-height ridges. In the north-eastern direction the Boryslavsko-Pokutskiy nappe is over-thrusted onto the Sambirskiy Nappe, and sometimes it almost fully covers the latter. Sambirskiy Thrust mainly includes various-sized nappes (sub-thrusts) composed of Miocene molassa only that comprised essential amount of olistostrome and salt-bearing rocks. This thrust, in turn, along sufficient distance in northeastern direction is overth rusted onto the External section of the Trough — Bilche-Volytska Zone. This is actually the margin of Eastern-European Platform filled with thick Late Miocene molassa buried along the system of north-west strike normal faults. The Platform basement is composed of mafic gneisses and granitoids of Archean — Early Proterozoic age. Sedimentary cover comprises Vendian, Paleozoic, Mesozoic, and Cenozoic sediments which form specific tectonic levels separated by basal horizons — Dnistrovska pericratonic monocline, Boyanetskiy trough, Stryiskiy Jurassic trough, Lvivska Cretaceous mold, and Cenozoic level composed of thin carbonate-terrigenous sequence which is almost horizontal-laying and overlain by the cover of sub-aqual (alluvial), sub-aerial (aeolian-delluvial, elluvial) and intermediate (delluvial-colluvial, delluvial-slided) rocks of Pliocene-Quaternary age. Considerable portion of the Region encompasses Ukrainian Carpathians which high-, medium-, and low-mountain relief forms elongated ridges and mountain massifs separated by numerous water-streams of diverse parameters. These include Chyvchynski Mountains (with top 1766 m high Chyvchyn Mountain), Grynyava Mountain (1590 m Baba-Lyudova Mountain), Chorni Gory (2061 m Goverla Mountain — highest one in Ukrainian Carpathians), Gorgany (1818 m Syvulya Mountain), Pokutsko-Bukovynski Carpathians (1491 m). Glacial forms (circus, kars, carlings) are the impressive counterparts of the high-mountain relief. On the Dnister right side there is Fore-Carpathian lowland that includes Pokutska, Sloboda-Rungurska, Maydan sections; Voynylivska and Prylukvinska hills; Ivano-Frankivska, Kaluska, and Rozhnyativska wide-side shallow gullies where terrace-accumulative relief forms predominate. North-eastern part of the Region (Dnister left-side) coincides with the margin of Podilska Height (up to 430 m high) where plain denudation relief with erosion gully and karst form prevails. Sourсe: Geological Landmarks of Ukraine: In 3 volumes/V.P. Bezvynniy, S.V. Biletski, O.B. Bobrovetal. ; V.L. Kalinin, D.S. Gurskiy, I.V. Antakova, Eds. — K.: DIA, 2006. — Volume I. « CROSS-SECTION OF KAMYANOPOTOTSKIY NAPPE.